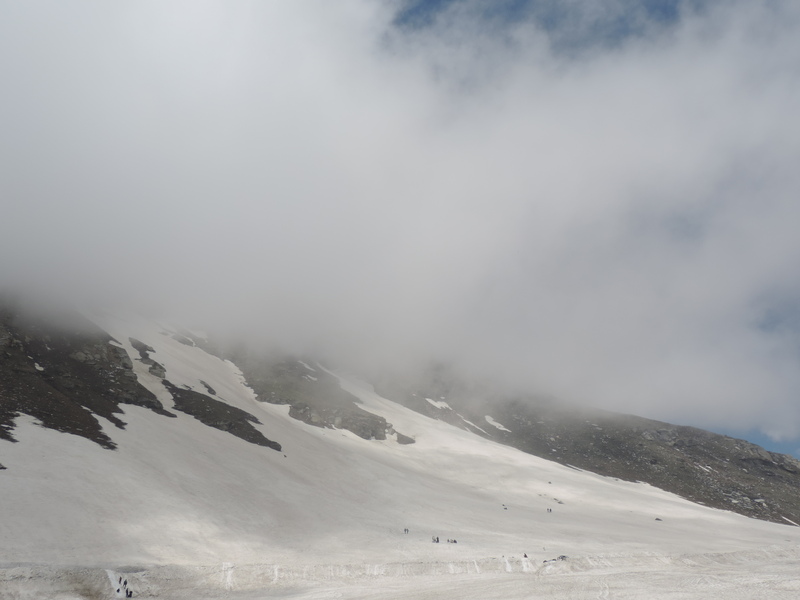 Rohtang Pass at an altitude of 13050 ft is the third highest Himalayan mountain pass I have been to! 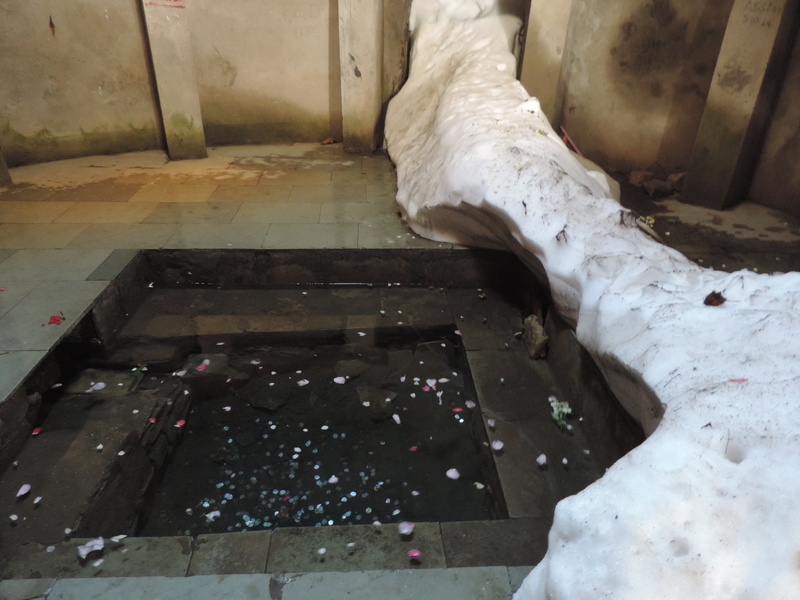 Out of all the places I visited in Himachal, this one had some hitches and glitches. 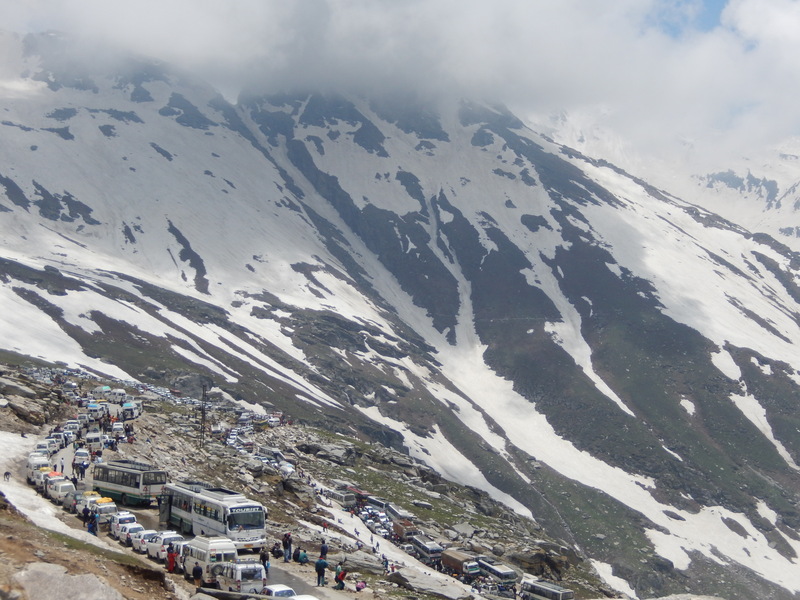 Here’s why… National Green Tribunal has restricted a total number of vehicles going from Manali to Rohtang Pass to 1,000 per day and each vehicle has to get a permit. Our travel agent had not got the permit well in advance and we were told that we have to get it ourselves and there was no guarantee of getting one unless we reach the office very early in the morning. While we were thinking of ways to make this trip happen we got to know that the hotel we were staying in, organises trips for its guests at an affordable price! Glad that we won’t be missing the most important place on our itinerary, we prepared ourselves for a very early start the following morning. 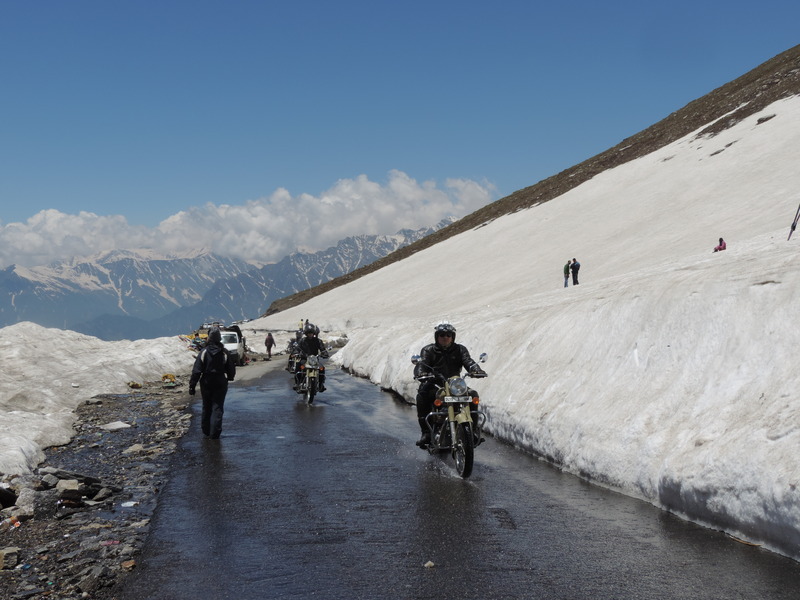 Rohtang is around 50km and a little over an hour-long journey from Manali. On the way, we made a quick stop to hire ski gear. This is not necessary if you are on enough layers of clothing, leather boots, and gloves as insulation. As I stated before, this would be the third mountain pass I was visiting, I had an idea on how the roads would be and what to expect when the altitude increases. Like last time I had not taken any pill unless I thought it was really necessary and I fared pretty well. No headache, no squeezy feeling, just excitement! This was our first time experiencing snow and ski slopes. 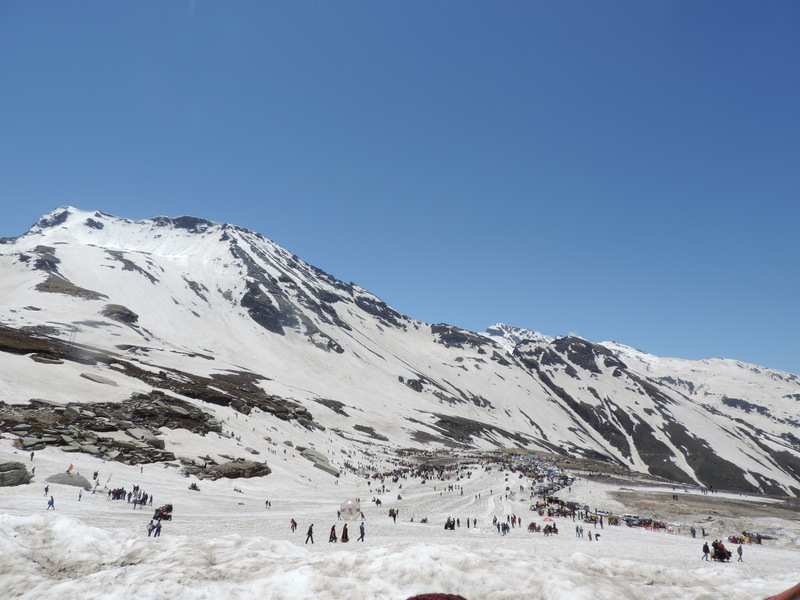 The panoramic view of the snow-clad mountains was breathtakingly beautiful. Stunning changes in weather leaves the people in awe. From bright and sunny to foggy in few minutes. It was disappointing to see the mountain base pretty messy and that’s when it dawned on me why NGT has a restriction on the number of vehicles going to the pass. I thought the step was required before the snow gets vanished from the glacier. Next up, the very exciting skiing! We had hired a guide who taught us all the techniques involved to ski on a gentle slope. The bindings which lock your boots to the ski is really heavy and is pretty difficult to walk in them. Wonder how many kilos it weighed! So our celebrity guide taught us how to balance ourselves on the ski, the way our knees have to be bent to prevent from falling and the angle your Ski should be in to facilitate sliding. 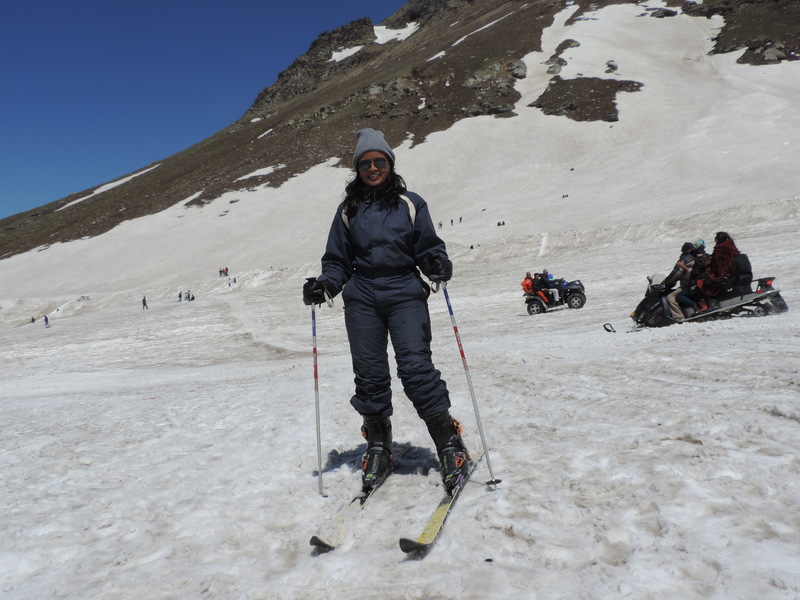 Aah, I said celebrity guide because we were told he has acted in many Bollywood movies and has trained actors and actresses who have skied here for movies! I have to admit he had immense patience. Every time we fell, he explained us with all patience. Your adventure only gets better when you have a good guide. After multiple trials and much more falls and even more laughter, we got off the bindings only after clicking enough pictures. If only skiing was as easy as posing! Generally, any guide would have called it a day after this. Our guide being the good guide took us trekking on another slope, leading to Manali-Leh highway. 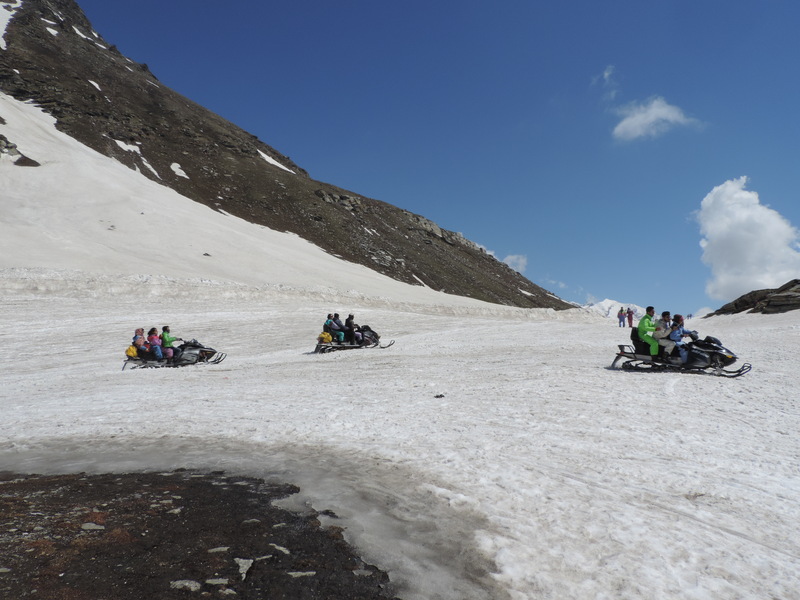 This is another famous spot of Rohtang as a song from the movie ‘Jab we met’ was shot here So after some more posing for pictures against the ice walls, we were delighted to find a makeshift tea stall by the highway. It wouldn’t be an exaggeration if I said I tasted the best tea ever, up there at that altitude. The tea-seller was also making Maggi noodles and though we all were well aware of the ban on the noodle brand we couldn’t care less and wholeheartedly enjoyed the most loved Maggi masala noodles. The hot and spicy noodles clubbed with delicious tea produced more breath vapour. The most satisfying simple pleasures life has to offer. Thus another adventure trip came to an end. The journey back to Manali took way too longer than it usually takes because of traffic congestion along the single lane. We could see many passers-by riding horses, bikes and many others stuck in traffic, sitting helplessly in their cars and then it got me thinking, I enjoy the terrains more than the seas. High altitudes are for me!